A Constitutional crisis looms between the secret service and US Marshals, on 4J’s side, preventing his arrest for perceived political motivations, and local law enforcement, intent on arresting him. Both sides are empowered to arrest the other side’s members under the jurisdiction of each. Which side prevails in the crisis? Will 4J be found guilty of the murder with his DNA found at the scene? April Michelle Davis spent one week proofreading Call of the Blue J for the self-publisher. She worked with the publisher to meet the author’s expectations and finalize a product the author could be proud of. The WLP Scorecard provides a structure for establishing goals, compiling information, tracking progress, quantifying effectiveness, and articulating results. 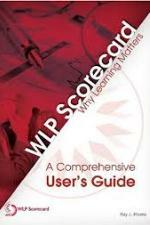 Use WLP Scorecard: Why Learning Matters to quickly and easily navigate through the complex scorecard implementation and measurement processes. April Michelle Davis indexed this 200-page book in two weeks. The client requested that the index follow the Chicago Manual of Style’s guidelines for indexes, so the index was alphabetized word by word. This allowed terms that began with the same word to be filed together in the index, increasing the usability for this audience. You are currently browsing the archives for the Featured Titles category.